Much like the blues, there’s beauty to be found in the simplicity of reggae. While the two genres share many structural and cultural similarities, reggae, unlike blues, is music often borne of both pleasure and pain. Song topics within the genre can range from personal strife to political revolution, but the lion's share of reggae songs center around an almost borderline-hedonistic approach of happiness above all else. I’m not one to discuss the history of the genre, it’s origins, or even the people that play it, but what I can speak to is my experience on June 28th at my first ever reggae concert. 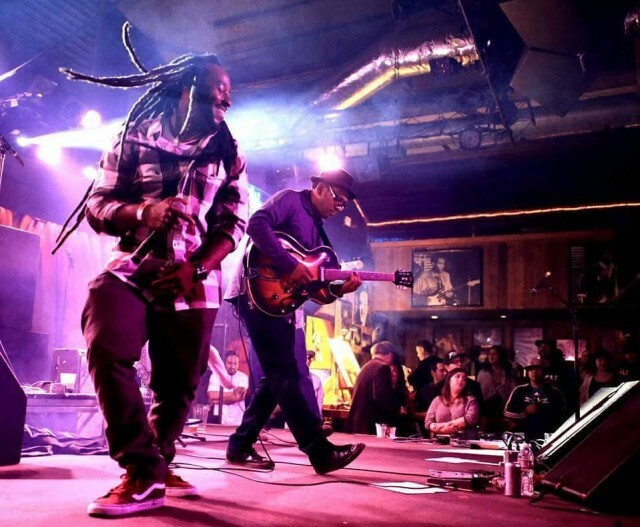 Occurring on a muggy Thursday evening in Portland, Oregon at the newly-renamed Sirens (fka Analog Cafe), headliner Arise Roots commandeered stage of the venue’s lower bar shortly after 10 pm to an audience ready to vibe out. Opening with a whir of electronic bloops and a single lightly-strummed guitar, we soon heard two cymbal taps followed by a bass that entered with a monumental riff. Smoke filled the air as the other instruments joined one by one, all falling in-synch with the established rhythm. Soon frontman Karim Israel made his way to the mic and crooned “What’s the fighting for?” over the arid soundscape of spaced-out instrumentals. Shortly after this refrain the drums suddenly kicked into a full-speed gallop, and the group fell into an uptempo groove that instantly got everyone moving. The next song in the setlist sped things up even faster, engaging the audience with a call-and-response chorus as Rodolfo Covarrubias’ bass bopped and Karim danced emphatically behind the mic. Within minutes I found myself hypnotized by the slow, swinging, steady rhythm of Arise Roots. As I stood witnessing the breadth of music on display, another genre-comparison I couldn’t help but make was between reggae music and stoner rock. Both weed-loving genres that worship, love, and chase the groove above all else. Arise Roots played as a single well-oiled machine, hitting all the right corners of the beat while also allowing enough room for members to wander off and improvise a solo with enough time to return to their original position. Ron Montoya’s tight drumming held the groove down, Chris Brennan and Todd Johnson shared backup vocal duties while also handling rhythm guitar and keys respectively, and the enigmatic frontman Karim Israel performed his heart out. Late-set “Nice and Slow” is the band’s latest single, a slow-moving love jam that went over well with the crowd and also happens to be one of the band’s most polished and varied tracks to date. Overall, the evening cast a genuinely hypnotic spell; Arise Roots are a transportive musical force with the ability to carry you from where you’re standing into the distant reaches of your mind, all without you even realizing it. A force of nature, love, and positive energy.